Lord Tokyo: "If I knew Christmas was comin' …I'd buy something for New Year"
Despite the struggling economy, Dominicans threw their sorrows and troubles aside like wet rags; they shopped and made merry to their hearts content over the past 48 hours- Christmas Eve and Christmas Day. At least those who could, did. On Christmas Eve, and a few days earlier, Roseau's sidewalks became virtual shopping malls. On every street corner you did not hear silver bells, as the Christmas carol suggests, but the voices of vendors selling everything from vines to pants to dolls to apples and grapes and pepper sauce and popcorn. But mainly toys and gifts in see-through plastic wrappings. In preparation for the shopping carnival, the police warned that, like spirits, they would be everywhere to deter criminals. And we await their report on criminal activity and lawlessness during the Christmas season,to assess the effectiveness of their threat. 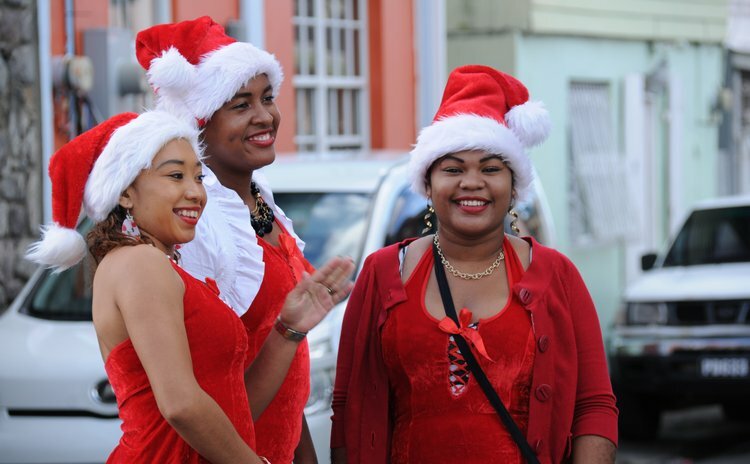 Churches held the usual Christmas Mas yesterday,Sunday December 25. Today is Boxing Day. We also noted the words from the Christmas messages of the nation's various leaders. For instance, His Excellency President Charles Savarin said in his message that the entire reason for Christmas is the love of God which should dwell among us. "The entire social program of our country can be seen in light of the call made to us in Luke 10 to love God with all our heart and to love our neighbour as we love ourselves," the President said. He continued: "The call to us in Matthew 25 is strengthened by the injunction in James 2 which tells us that "faith by itself, if not accompanied by action, is dead". "To love God we must have faith in God and to have faith in God is to do His bidding, to love our neighbour as ourselves and to demonstrate that love by our deeds". While Prime Minister Roosevelt Skerrit, in his Christmas message hyped his government post-Tropical Storm rehabilitation programme, Lennox Linton, the Leader of the Opposition, underlined the current problems of Dominican society. "As we review and reflect over the year that is slowly passing, there is much that we should be thankful for," said the Prime Minister. "We have made steady progress in rebuilding some of the critical and vulnerable areas of our road infrastructure post Erika". He added: "We have resettled the entire village of Dubique in newly built homes at Centre in Grand Bay. In doing so, we have reduced the overcrowding that existed within some families where two or three generations were sheltered previously under the same roof. "As a result of the strong and growing support we continue to receive from interested financiers and development partners, we are more and more confident that we will be able to construct a geothermal plant by the end of 2019. We expect this will have the effect of lowering electricity rates to consumers and increase the competitiveness of the productive sectors of our economy. "We also thank God that through our own efforts, we have been able to generate the resources needed to partly finance the rebuilding and rehabilitation of our infrastructure and to provide support to the neediest of the needy of our citizens". On the other hand, Linton said 2016 was "another 12-month catalogue of increasing poverty, joblessness, spiraling cost of living, senseless murders, epidemics, lies from the powerful to fool the powerless and unrelenting abuse of state resources for the benefit of a privileged few". He continued: "Yet in response to "come all ye faithful, joyful and triumphant", and as the leadership of the Christian Church pretends to see and hear no evil, we retreat from the harsh and deeply troubling realities of our time to sing the carols that seem to comfort a suffering nation with inspirational claims like "Joy to the World; the Lord has come". From the corrupt manipulation of the sale of Dominican passports; to the obsession with stealing elections and stifling democracy; to the continuing destruction of the economy - all for private gain - there were no shortage of reminders this year that for many among us while the sorrows grow the blessings just don't seem to flow". Then again, Thomas Letang, the General Secretary of the Dominica Public Service Union (DPSU) in his Christmas message dreamt the "impossible dream" -one that only God can make real. "As we celebrate Christ's birth let us pray knowing that with him nothing is impossible that He will allow us to witness that time where instead of division we will experience unity; love will replace hatred; envy and strife will give way to kindness; instead of war we will have peace; mental slavery will be non- existent and that we will sing songs of freedom," Letang said. Since Christmas is, or should be, a religious holiday, Bishop of Roseau, Gabriel Malzaire, put the event in its correct perspective. He said: "The story of Christmas, as we know, has to do with the fact that God in his love and mercy, sent his Son, Jesus, as an absolutely free gift to make salvation possible for humanity." Then he added that: "In the light of all that God has done for us, the question which inevitably presents itself to every Christian, to every person of good will, is: what will we bring to the Christ-Child? It is another way of asking, what will we contribute to the advancement of humanity, to nation building, to the growth of families and homes, and, consequently, to our personal advancement. I believe that adopting a Christo-centric or Christmas-centered/ Christ-centered disposition can be the answer to the many challenges and problems which plague today". Bishop Malzaire said he believed that if we follow the real message of Christmas, i.e. giving freely every day, Dominica s would solve its numerous difficulties. "I am convinced that a Christmas attitude towards life is the answer to all the challenges we encounter in both Church and society. Christmas is vocation, Christmas is mission, Christmas is salvation. At Christmas, God has given completely in order to teach us how to give," Bishop Malzaire said.